In Scotland a red door is a way to show that you have paid off your mortgage and own your home out right! In Asian culture, a red door is often seen as a symbol of good luck! From a Biblical standpoint, it can mean protection; coming from the idea that the color red symbolizes the blood of Christ and protects you from evil! In Feng Shui, red is a bold color that promotes positivity. 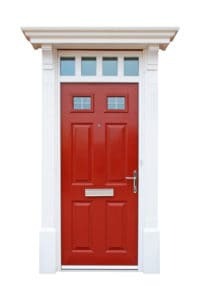 And, since a door is where energy enters the home, a red door creates a welcoming energy! Your home is a reflection of who you are. You may want to take some of these beliefs into consideration if you’re thinking about painting your front door. Just think, it’s normally the first thing somebody notices about your home- it’s usually the main exterior focal point! What does it mean to you? What do you want to portray? Are you looking to purchase a home with a red door? Or another color for that matter? Let The Peters Company help with your home search! Need a good painter recommendation to paint your current door red? We can help there too! ← Home Inspection Prep Tips from the Pros!